Don’t Scare Away Texas Voters! 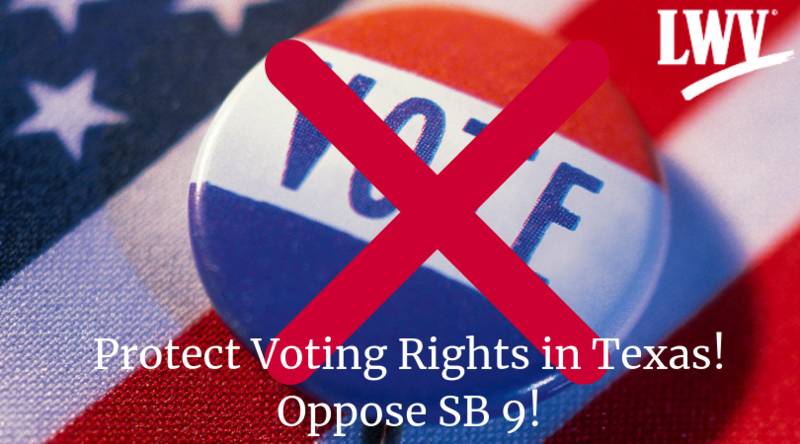 New Action Alert to Oppose SB 9 which would make it more difficult to vote. It would create new barriers on those needing assistance to vote, loosen safeguards protecting voter's private information, and bolster an ongoing campaign of selective criminal prosecutions. New Bills on Redistricting Commissions! We now have a bill and two Joint Resolutions filed to establish Citizens Redistricting Commissions! Let’s get them moving! Support Climate Change Commissions! Tell the House Environmental Regulation Committee to bring Climate Change bills up for a hearing! Continuing Action Alerts! For more, visit the Action Alerts webpage. Share the SB 9 and Redistricting Commissions Action Alert videos on social media! POLLS - Where Are Texans On Our Issues? A statewide poll released by the Center for Public Policy Priorities (CPPP) on March 7 showed that “a strong majority of Texans (87%) agree that local governments are better connected to the community and should be allowed to pass policies that reflect their community’s needs and values.” Texas voters also thought communities should pass ordinances to require employers to provide paid sick leave (74%), enact a higher minimum wage (67%), and be able to set their local tax rates (78%). We agree that there should be local control over issues such as these, and so we OPPOSE SB 15, which would restrict local control. We put out an Action Alert on it two weeks ago and the alert got over 60 responses. Please send your Senator this alert as the full Senate will vote soon! Another poll by the University of Texas and the Texas Tribune, released on March 4, showed that 74% of Texas voters thought the US government should be doing “a great deal” or a “moderate amount” on climate change. Approximately 15 bills have been filed, but none have been scheduled for a hearing at this time. Our Action Alert on Climate Change will now go to the members of the House Environmental Regulations Committee to ask them to hear six of these bills. Texas must begin to address this problem! Keep up with your priority issues! Voting Rights & Election Laws - Cinde Weatherby (Austin) (March 7) We have delivered six testimonies and registered our support or opposition on eight other bills! Financing Public Education - Diann Andy (San Antonio) (March 8) What will the new House Education Finance bill (HB 3) do? Women’s Health - Louise Hytken (Dallas) (March 7) LWV is following several new bills which would restrict abortion and contraceptive access that have been filed in the past 2 weeks. Click on the issue to read the updated issue blog. Behavioral Health - Alissa Sughrue (Austin Area) Ten important bills were heard in committee! Child Abuse - V’Anne Huser (Lavaca Co.) New statistics on Child Abuse in Texas. Child Health - Celia Kaye (Collin Co.) Hearings held on Child Health Coverage in Austin, and on Gun Violence research in Washington! Climate Change - Michael Imhoff (Collin Co.) The Environmental Regulation Committee needs to hear six Climate Change bills. Criminal Justice - Elaine Talarski (San Antonio) We testified on HB 465 to reform the bail system for low-income people. Domestic Violence - V'Anne Huser (Lavaca Co.) We need more funding for family violence services! Postcard deadline is March 19. Equal Opportunity - Amber Briggle (Denton) Why we need to oppose SB 15! Immigration - Gloria Suarez Sasser (Comal Co.) Two new bills on children in detention. Judicial Selection - Julie Lowenberg (Dallas) Finally! Two bills calling for a joint interim committee to study judicial selection. Land Use - Jensie Madden (Comal) Our action on Flood Control Planning, Eminent Domain, and State Parks. Pay-Day and Auto Title Lending - Stephanie Mace (Collin Co.) Two important bills heard in committee, plus new bills filed. Redistricting/Census - Stephanie Swanson (Austin) Updates on Redistricting bills! See the Action Alert above. Transportation - Britin Bostick (Austin) Transportation bills recently heard in committee. Water Resources - Cyndi Jackson (Hays Co.) A new bill to restrict pollution of our water! Go to the League's Advocacy & Issues webpage to see all the League issues.